The Sevilla Series from Habanos is an exclusive and limited collection for the Spanish market. This line is presented in earthenware jars made on the island of La Cartuja in Sevilla. The cigars have been carefully aged, in a replica of the jars produced by this same firm in the middle of last century for the brand Partagás and Ramón Allones, which became museum pieces. The Serie Sevilla to this day has two special editions. The first 2016 edition, with 21 Montecristo No.3’s, and the second with 21 Hoyo Monterrey Epicure Especial cigars. All were numbered releases limited to 2000 pieces only. 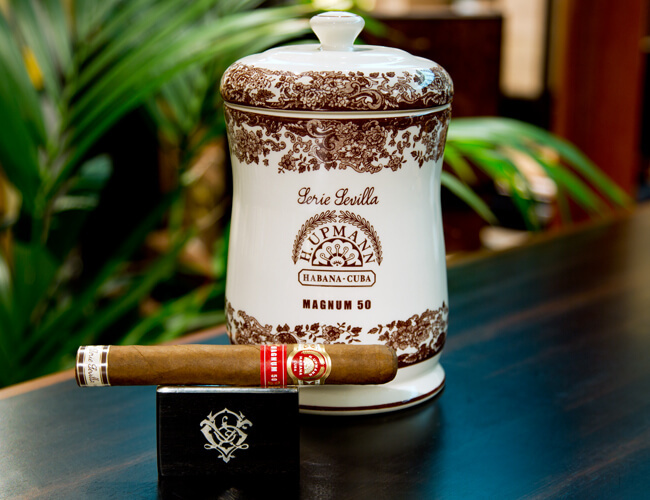 The H.Upmann Magnum 50 have been carefully aged for at least five years with the best conditions. With aging, the wrapper becomes darker and more silky, the flavors and taste settles, strength is reduced resulting in a roundness to the vitola. A very beautiful presentation and a nice way to go up in smoke was offered to this mythical cigar!